At Six Lakes, we believe there is no better way to enjoy the outdoor experience than to spend a few nights out under the stars. 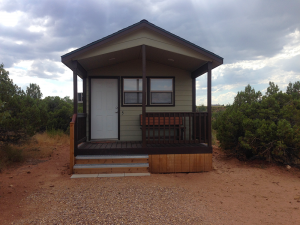 At our camping sites, large and small groups alike are able to enjoy the recreational opportunities and wildlife that Six Lakes has to offer. Much like our cabin sites, the camping sites provide excellent views and easy access to our lakes. Those who enjoy fishing or wildlife viewing will want to crawl out of bed early and enjoy the peaceful morning hours at Six Lakes. 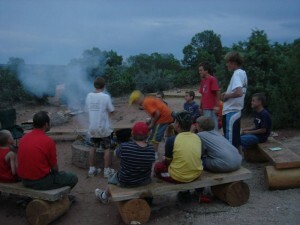 The Camp Canoe Group Use Area features 3 camper cabins and 5 tent sites, a covered pavilion with picnic benches, and a fire pit with log benches. 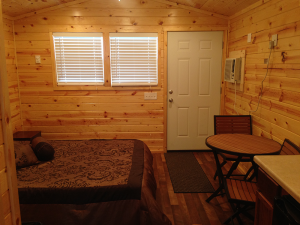 The camper cabins each have a bathroom, kitchen area, and a bedroom with a queen bed and bunkbed (2 twin beds). The canoe group use area also has access to 2 RV sites and additional space in the parking lot for dry RVs. 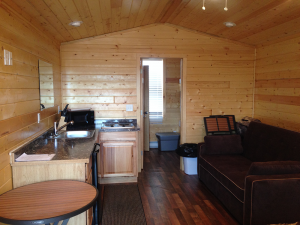 The rental of this group area gives you access to the campground bathroom with showers. 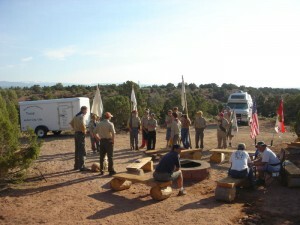 The Camp Teepee Group Use Area features 2 camper cabins and 5 tent sites, a covered pavilion with picnic benches, and a fire pit with log benches. 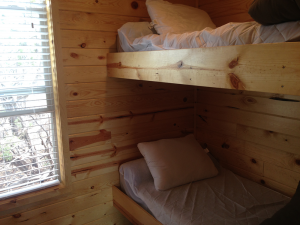 The camper cabins each have a bathroom, kitchen area, and a bedroom with a queen bed and bunkbed (2 twin beds). The canoe group use area also has access to 2 RV sites and additional space in the parking lot for dry RVs. 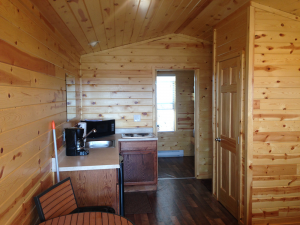 The rental of this group area gives you access to the campground bathroom with showers. Located on the south shores of Totem Lake, Both private campgrounds are set among the juniper trees and offer great views of Totem Lake, The Uintah Mountians & Big Sandwash Reservoir, each camp is well-suited for groups from 2 – 20 people. Campers may enjoy fishing, canoeing, and recreating at Totem Lake and Cliff Lake. Endless hiking, exploring, and wildlife viewing awaits our campers. Each camp has five total designated tent pads, a large fire pit with benches, a covered pavilion with tables, running water, and access to bathrooms and showers within walking distance. Because the ‘high desert’ & ‘wetland’ environment of the camping areas is fragile, we encourage all guests to tread lightly and be conservation minded while visiting and recreating at Six Lakes. If we all work together, we can preserve the natural beauty and rare environment that surrounds the campsites.